11 Best Team Chat Apps (To Use in 2019): Who’s Here to Stay? The SMS text messaging is now passe`, especially with the advent of the modern-age chat applications. There are work chat apps or business apps for the workplace and personal messaging apps for personal matters. Each one of us is aware of the importance of effective communication and collaboration at work. Using the right team chat software can not just streamline your communication process but also save a lot of time. What is the best app for team communication? Team chat apps are definitely not the ‘latest thing’ in the market but these are making way for seamless communication and innovative approaches for sure. Team chat applications are no longer limited to organizing team conversations and searching topics but have become a way of life too. As per a survey conducted by Statista, 53 percent of businesses worldwide had adopted collaboration tools by 2016, and the number is consistently increasing ever since. As businesses are looking for digital solutions, the use of work chat apps and collaboration tools is on the rise to improve collaboration. No points for guessing, team chat software is designed to enable seamless communication between team members. It’s not always possible to be physically around all the time. Such tools let you have a conversation and share ideas messages, documents, videos even from remote places. A team communication tool help remote team members to work efficiently. It’s an effective way to streamline the workflow of an organization. With these tools, team members can have virtual daily meetings where they can share current tasks, plan sprints, and even ask for instant feedback. 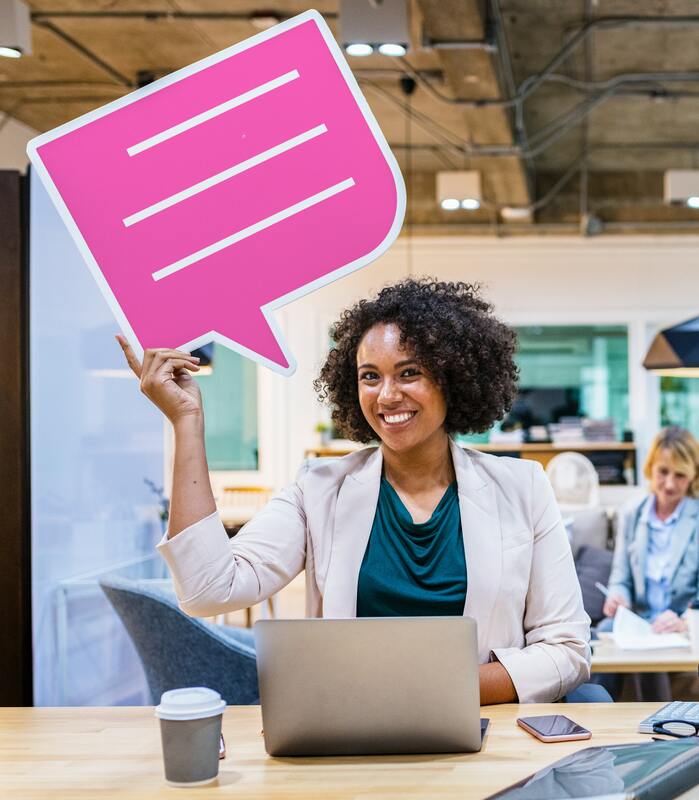 Although the main task of an office chat software is to bring people together and facilitate an organization’s workflow, it also increases employee engagement at the same time. When employees are engaged, overall employee productivity also improves. The purpose of internal communication is also to make people accountable for their tasks and job responsibilities. As team members have to update managers about the progress, thus quite effectively, they develop a sense of responsibility towards their work and share updates with office chat tools. Effective project management is only possible with effective coordination. When you communicate effectively, the chances of confusion and mistakes also lessen. It is one of the most optimum ways to make sure if things are on track or not. Thus, team chat software does make way for seamless project management. It’s common to lose track of what has been done, what’s happening, and what needs to be done when things are already in motion. Team collaboration apps are helpful in maintaining order and managing stages that help you stay organized. Work and deadlines both go hand-in-hand. It’s essential to take care of time while collaborating with others. A quintessential team chat app is one that cuts down the time you’d have to spend by actually getting up and going to a person to ask something. The coordinated work saves not just time but also resources and efforts. 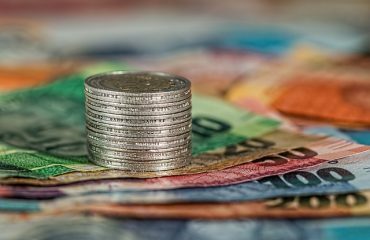 The more time you save, the lesser would be unwanted expenses. When people work together on different tasks and projects, they tend to develop a healthy working relationship among other team members. Talking to fellow team members on chat or in person enables you to foster a healthy work environment which leads to innovation and development. 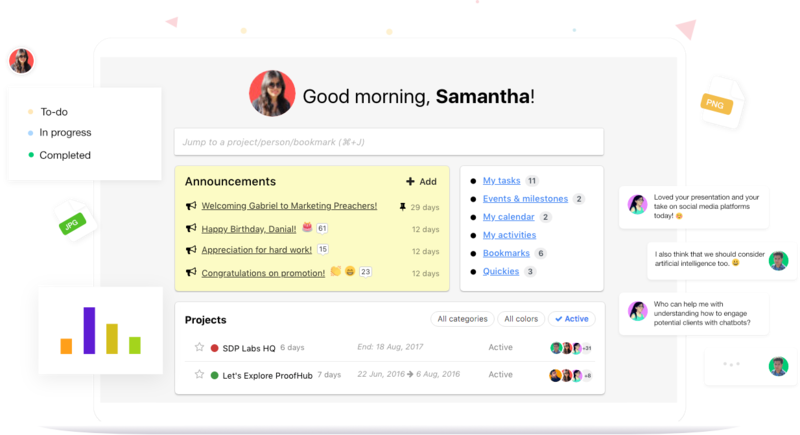 ProofHub is a team communication software that brings all your project communications together at one place. It is the perfect place for every conversation and brings sanity in the way your teams communicate within an office or with clients. Summary: ProofHub is an all-in-one team collaboration software with powerful features that eliminates the need to invest in too many tools for your business. Slack is one of the first few team chat applications that comes to mind when we hear about team collaboration. Many teams throughout the world have been using it to improve team communication and efficiency. It covers your instant messaging (IM) basics and also supports file-sharing, automatic syncing across different devices. 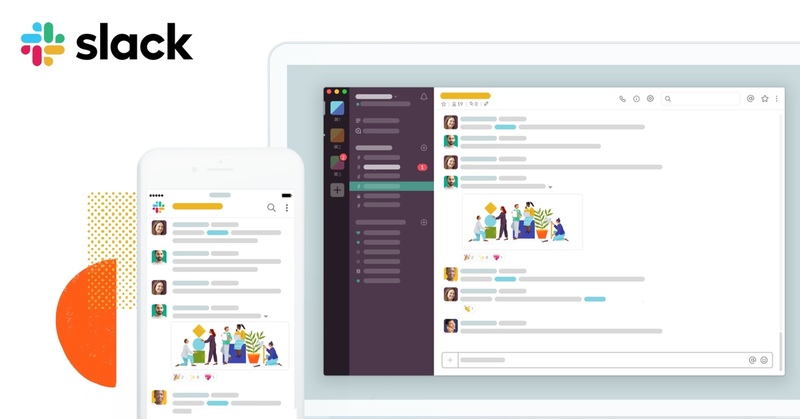 Summary: Slack is a collaboration hub for work, no matter what you do. Conversations are searchable by anyone. Slack works with many tools and services you already use every day. Rocket.Chat is an open source team communication tool released in 2015. It lets you communicate and collaborate with your team, share files, chat in real-time or even switch to audio/video conferencing. It also allows you to customize and add new functionalities to the tool as per your needs and requirements. Summary: Rocket.Chat is the best open-source communication tool in the market. So, just open up the conversation and remove the need for CC/BCC by using its channels and private groups. 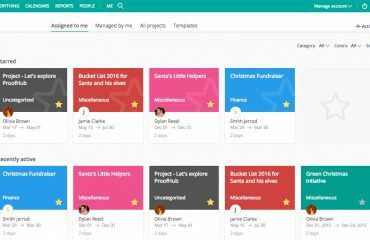 Hangouts is a communication platform developed by Google which is helping many users to initiate and engage in various communication channels without any effort. Whether one-on-one implementation or in group wise, Hangouts is one of the most preferred tools out there in the world. Summary: Hangouts is the perfect cost-effective collaboration platform for entrepreneurs and business owners who are looking for a team communication tool via text, audio, and videos. Workplace combines next-gen technology and versatile features to bring an evolution in the world of communications for businesses of all sizes and nature. 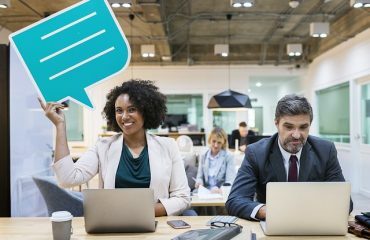 Employees can use the platform to connect with each other through instant messaging and those who work in common departments can make groups to carry out meaningful conversations. Live video streaming, unlimited file, photo, and video storage, secure collaboration Voice and video calls, integration with file storage providers, desktop notifier for Windows, APIs for integrations and bots, integrations with G Suite, Okta, Windows Azure AD and more. Summary: As a team chat software, Facebook Workplace promotes openness, feedback to engage employees and drive cultural change. Using multiple apps and email to communicate is both complex and difficult. Ryver is a team collaboration tool that makes managing your team simple and hassle-free. It’s proprietary Active Response Technology™ eliminates error-prone, slow human response time and replaces it with a powerful, automated event response collaboration system. Summary: Ryver is simple and straight-forward that brings all your team communication at one place. 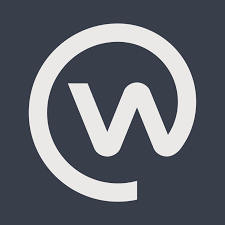 Flowdock is a real-time team chat software that brings all of your workplace conversations, work items, and tools at one place. It lets you prioritize work, solve problems across teams, locations, and timezones. 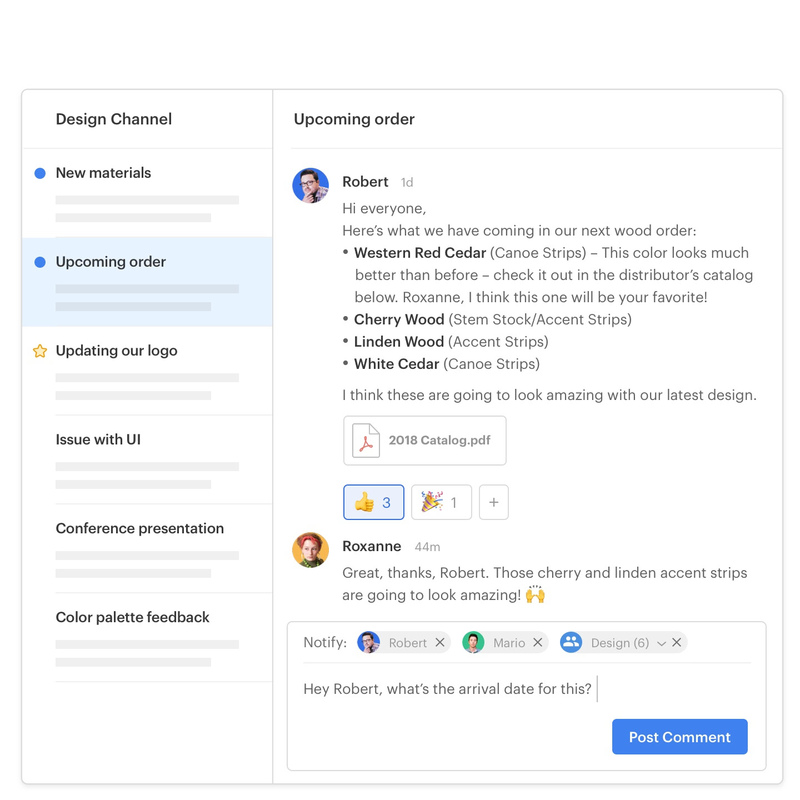 Flowdock works with flows which are open source spaces for teams to converse and collaborate allowing you to invite project stakeholders to participate in discussions and see updates from tools. 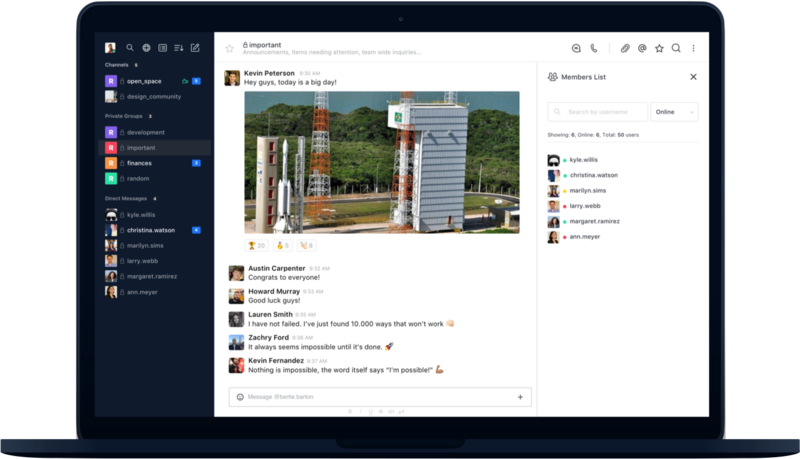 Summary: Flowdock is a hub for social team collaboration that incorporates a wide variety of inbox and chatting features with more than 35 integrations. RingCentral is one of the most popular business solutions designed to help people stay in constant touch and collaborate. It’s no surprise that Glip is made around the same principles. It is a collaboration software app with free messaging, group video chat, and task management for better team communication. It comes with superior team messaging, task management, screen-sharing capabilities that let you work, meet, and message anytime and anywhere across multiple devices. Includes unlimited storage, integrations, and guest users, 500 min. of shared video chat. Unlimited chat, unlimited storage, unlimited guest users, unlimited integrations, unlimited teams, shared video, Extends the limit of shared video chat to 1,000 min. 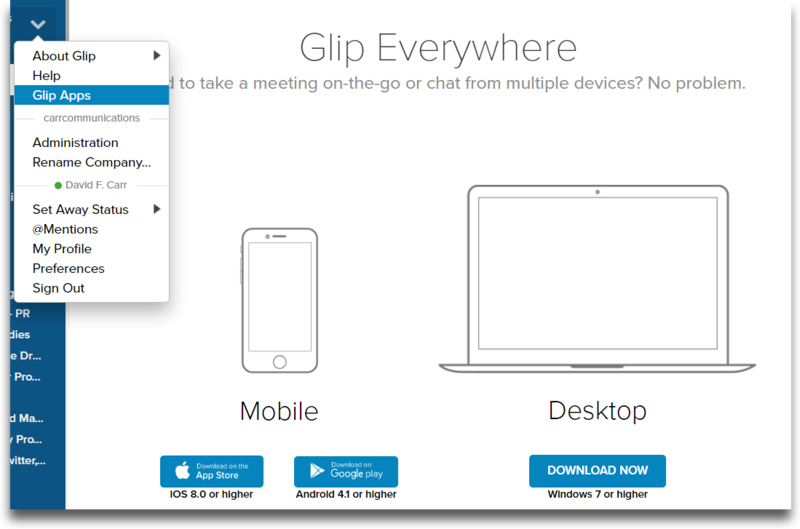 Summary: Glip gives you team messaging with file sharing, task management, and screen sharing in one collaboration tool. 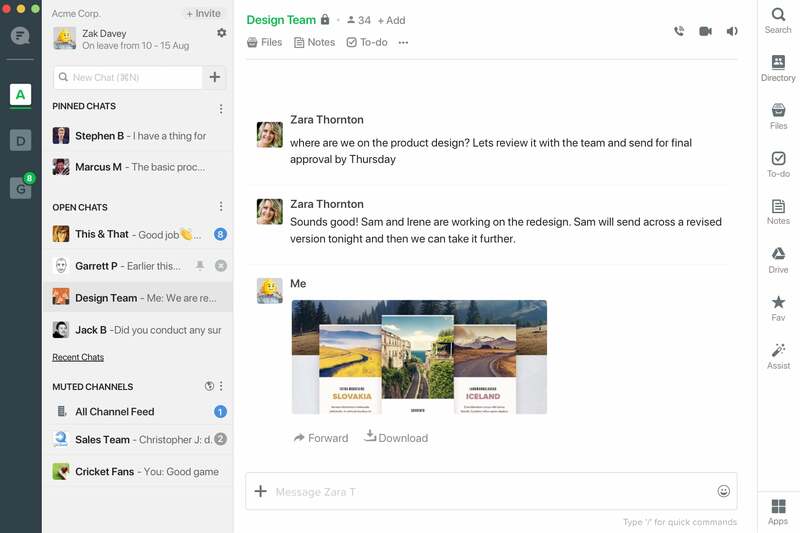 Flock is a popular team communication app and online collaboration platformthat comes with team messaging, project management and other great features in one software. It effectively organizes all your conversations, tools in one place so that you can focus on what matters the most. In simpler words, it is convenient, real-time, and makes communication seamless and easy. Summary: Flock gathers all the tools you need to communicate at one place with advanced project management features as well. 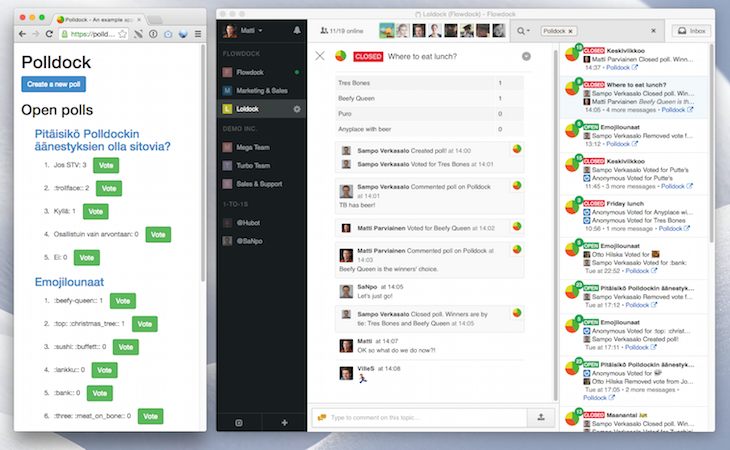 Twist is a highly trusted team communication tool for remote teamwork that demands a higher standard for communication. For people working from home or remote areas, Twist acts as an organized hub to discuss ideas, share updates, and build knowledge that the team can refer even after several years. It helps you focus on real work and connect with others in real-time. Summary: Twist is a great team communication tool especially for remote teams that makes communication calm, organized, and transparent. As an office chat software, Convo unifies your workforce with easy conversations between in-house teams and remote teams. You can use this tool as a central place for having discussions, collaboration, and making faster decisions in real-time. Summary: It lets you share things easily in the endless reply chains of email with better collaboration. 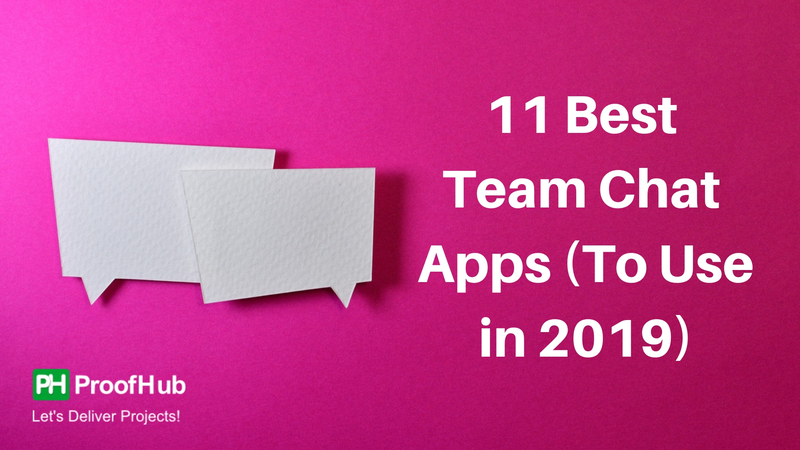 These are just 11 team chat and office communication tools, there are many more out there. Share your experience if you’ve used any of these tools for improving workplace collaboration. If you think that we’ve missed anything, feel free to share your thoughts in the comments.